Nature has given cotton qualities that make it a smoother, softer and more comfortable choice. Cotton is a soft, fluffy fibre almost entirely made of cellulose that grows in a protective case, around the seeds of the cotton plant. Being among the finer fibres available naturally, cotton breathes, so cotton sheets feel cool against your skin. It is an eco-friendly, renewable resource which provides a livelihood for millions of people worldwide. Fine linens begin with fine cotton, and the quality of the cotton depends on the length of the individual fibres, or staples - the longer the staple, the better the cotton, allowing the cotton to be spun into a finer-textured thread with more tensile strength, and woven into a softer, smoother and more supple fabric. Thread count simply refers to how many threads – Vertically and Horizontally – are woven into one square inch of fabric. With finer threads, such as those produced with pure Egyptian cotton, more threads can be woven into each square inch, which produces in turn, a finer, softer and more flexible material. In general, the higher the thread count, the higher the quality of the sheets. The thread count of basic or standard cotton is around 150 – good quality sheets start at 180 thread count and are considered percale. Whilst thread count is a consideration, there are features much more important to measuring comfort, quality, and value. This includes the type of cotton, the feel of the fabric and the nature of the finishing process. Percale is a closely woven, plain weave, spun fabric made from both carded and combed yarns and Percale sheeting is the finest available. The high thread count – above 180 - gives the fabric a soft, silk-like feel. Sateen is weave construction that has more yarn surface on the face of the cloth than other basic weaves giving a softer and more lustrous look resembling satin. The way in which fabric is woven also has an effect on its feel. Cotton sateen sheets are frequently softer than those with a Percale weave. A sateen weave has more warp threads on the surface, resulting in a silk-like touch and attractive lustre or sheen. As to which is better there is no answer as it’s a matter of personal taste; some people prefer the crispness of a percale weave, others like the smoothness of the sateen weave. No one knows exactly how old cotton is. Scientists searching caves in Mexico found bits of cotton bolls and pieces of cotton cloth that proved to be at least 7,000 years old. They also found that the cotton itself was much like that grown in America today. Arab merchants brought cotton cloth to Europe about 800 A.D. When Columbus discovered America in 1492, he found cotton growing in the Bahama Islands. By 1500, cotton was known generally throughout the world. 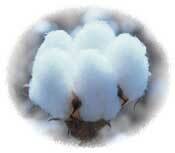 Cotton seed are believed to have been planted in Florida in 1556 and in Virginia in 1607. By 1616, colonists were growing cotton along the James River in Virginia. Cotton was first spun by machinery in England in 1730. The industrial revolution in England and the invention of the cotton gin in the U.S. paved the way for the important place cotton holds in the world today. Eli Whitney, a native of Massachusetts, secured a patent on the cotton gin in 1793, though patent office records indicate that the first cotton gin may have been built by a machinist named Noah Homes two years before Whitney’s patent was filed. The gin, short for engine, could do the work 10 times faster than by hand. The gin made it possible to supply large quantities of cotton fiber to the fast-growing textile industry. Within 10 years, the value of the U.S. cotton crop rose from $150,000 to more than $8 million.